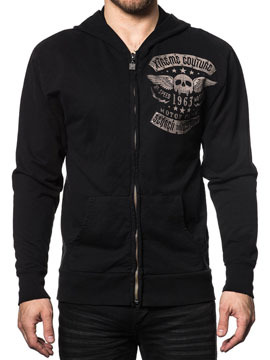 Xtreme Couture Faded Iron mens long sleeve zip hoodie features Xtreme Couture Search and Destroy Hi Speed Motor Club 1963 logos with a skull, angel wings and stars printed on one side of the chest. The back features a larger versions of Xtreme Couture Search and Destroy Hi Speed Motor Club 1963 logos with a large skull, angel wings, stars and lightning bolts printed in the center. Distressed and vintage look. 100% cotton, light weight, slim fit. Color: black.